Bondholder PKF Cooper Parry has made 68 new appointments, taking the total number of new jobs created over the past 12 months into three figures. The firm is the fastest growing firm of accountants in the UK and is enjoying an unprecedented number of new client wins. The biggest area of growth has been in the audit team, where 43 new team members have been recruited. These latest appointments take the number of new posts created over the past 12 months to 110 and keep the firm on target to exceed its target turnover of £30m for this financial year. Ade Cheatham, CEO, said: "Our business continues to grow like crazy across all areas and this latest round of appointments now gives us over 400 passionate, dedicated people, who will drive the business forward over the next 12 months. “Our unique culture and working environment enables us to recruit the highest calibre of people. We have a really talented team around us, which will enable us achieve our long term aim of creating a £45m turnover firm within the next three years, reaching £150m within the next 10 years." Plans for a £2.5M extension for Bondholder Mercia Marina have been approved. The extension will increase parking capacity, and will bring new shops, restaurants, cafes and offices to the Marina. The Marina already attracts over 800,000 visitors annually, and Robert Neff, General Manager, hopes this number will increase. The development is expected to create 150 new jobs. Robert said: "Our exciting new development proposal demonstrates just how successful we have become as a destination. “Since the marina opened in 2008, we have become recognised as a major regional tourist attraction, not only for shopping, eating and drinking, but also boat trips, boat holidays, lodge holidays and much more. It’s so great to welcome both Louise and Gareth to the team. This year we have already attracted quite a few new recruits, but these latest additions will strengthen our offering here in the region even more, adding further value and support to our clients. Bondholder accountancy and business advisory firm, Mazars has welcomed two new employees to the business. VAT Manager, Gareth Jones, and Audit Senior Manager, Louise Garcia, are the latest recruits to join the firm. Having worked in VAT for over 12 years, including four years with HMRC, Mountsorrel-local Gareth brings a wealth of experience to the role, and will be responsible for supporting clients and providing VAT advice. With over 25 years’ experience, Louise Garcia will be responsible for the company’s client relationships, client service and will be the first port of call for many of the firm’s clients. She will also help in the continued investment and development of Mazars. Louise said; “I was first attracted to Mazars because of its international reach and the breadth and depth of the firm’s reputation. The great thing about Mazars is that it has lots of specialisms and is a big company yet it has the capability of both a high quality service and a focused approach for its clients." Nikki Kinsey, Associate Director of Bondholder Sellick Partnership, has been appointed to the Board of Trustees of charity The Maria Hanson Foundation. Nikki has been a strong advocate of the Foundation since 2014 and along with her team at Sellick Partnership has raised almost £5,000 for the cause. The Maria Hanson Foundation arranges holidays for adults and children with life limiting conditions. The sixth generation of family-owned funeral directors G Wathall & Son have joined the Bondholder business in key roles. Bec and Charlotte Wathall have joined the business - working alongside their mother and company managing director Helen Wathall. Bec, who has joined as Helen's personal assistant, said: “This is an exciting time to be joining the business and I am particularly enjoying taking the lead on updating our technology to modernise the way we do things and being involved in our expansion and re-branding at the new branches. As part of its regional expansion plans, Bondholder Serjeants has appointed Leanne Hall as its new trademark attorney. At the trademark and patent firm, Leanne will be advising on the protection and enforcement of trademarks for the firm’s clients as well as working with the partners to grow the business. Serjeants expanded into Derby earlier this year, and opened their office in the iHub, part of the Bondholder Connect scheme, in Infinity Park. Leanne said: “I am looking forward to the challenge of being back in private practice; from previous experience no two days are ever the same! I am also looking forward to building up client relationships – helping and educating them to ensure that they have the correct protection for their brands and businesses”. Bondholder Smith Partnership is expanding its teams with six new members of staff - four Solicitors, one Legal Clerk and one Paralegal. In 2017, Smith Partnership will be entering its 30th year in business and are continuing to invest in their staff. Liam Kreibich – Solicitor (Dispute Resolution). Bondholder BB&J Commercial has announced two new appointments to its partnership. Joining existing Partners Rob Jones, Mark Richardson and Chris Birds are Graham Bancroft and Chris Wright. Mark Richardson, Partner, said of the appointments: “These promotions represent a significant landmark in both BB&J’s heritage and future growth strategy. "Over recent years we have continued to expand despite a challenging backdrop and all four individuals have played a major role in contributing to this success. "We are now the top agency in Derby city centre across both residential and commercial property, and plan to grow further as a major player within the East Midlands." Bondholder firm EMBS have moved offices into the historic Long Mill in world heritage site Darley Abbey Mills. Simon Bucknell, Director, said: "We’ve been looking for a new site for the business for many years but didn’t want a modern office. We were keen to find somewhere with a soul, with history with a story. We also wanted to find a place that we could connect to our brand and would allow for hyper growth. 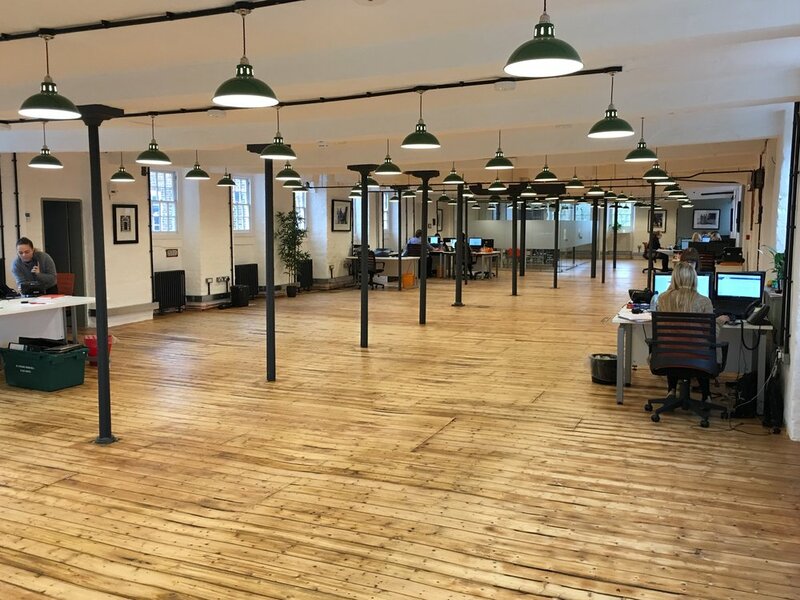 "Our office in the Long Mill can house up to 50 people, giving us huge potential for growth. In 2017 we will continue our Graduate Academy and look to hire the next cohort of Recruiters and continue the development of our four main divisions IT, Engineering, Operations and Property." Associate Director at Bondholder firm Morrison Design, Peter Newman has taken over the helm of fellow Bondholder Derby College’s Professional Construction Employment & Skills Academy. Newman will chair an Advisory Board of representatives from ten other local and regional companies specialising in all aspects of professional construction, and has taken over from Rebecca Hartshorn, Design and Sustainability Manager at Bowmer & Kirkland. The employers will provide a wide range of work placements, visits, projects, mock interviews and specialist lectures for learners and apprentices on the full and part time Professional Construction study programmes. Peter Newman said: "Many aspects of professional construction suffer from skills shortages so, by raising the profile of the industry amongst young people and supporting them into the workplace, we can tackle this growing issue. “It is vital that employers work closely with education providers to bridge the gap between the skills provided and the reality of what is required in the workplace. “By bringing together professionals from across the industry, we are able to share the broader view on skills requirements and offer the learners a wide range of experience as part of their study programmes. “Morrison Design has a long relationship with Derby College and have recruited a number of young people in apprenticeship roles here. “We have a number of long standing clients in specialist industries ranging from hotel and leisure to nuclear and science facilities. April Hayhurst, Derby College Deputy Principal – Employer and Economic Affairs, added: “Employers consistently tell us that they want young people who are work ready and have the employability skills that will help them to grow their business. “The Employment and Skills Academies are designed to do just that by bringing together employers and their staff together with students to bridge the skills gap and provides young people with a springboard into employment. Bondholder Derby Museums Trust has appointed a new Chair. Pat Coleman, vice-chair of Derby Museums Trust for four years, has taken over after Peter Smith stepped down. Pat's role will include leading the future direction of the museums, including a £18m redevelopment of the Silk Mill due to start in 2018. And with a variety of historic and priceless exhibits, including the world-renowned Joseph Wright Collection, all looked after by around 50 staff Pat is keen to develop something special and lasting in her home city. Pat said: “As a child I used to come to the museum and art gallery to see the Egyptian mummies and model railway among other things. “I want to make sure that the opportunities to visit Derby's museums and be amazed at the exhibits will be available to current and future generations." Since expanding into Derby a year ago, Bondholder company YMD Boon is continuing to grow. The architecture firm is currently working on a number of local and regional projects, including a substantial office complex on Kedleston Road, after being appointed by fellow Bondholder Derby City Council. The £1m project will see the major remodeling and refurbishment of two existing buildings plus an extension. Shari Setayesh, Director of the firm and Derby office lead, said: “With our existing client base in Derby, its excellent central location and road network, a Derby office was an obvious choice and in line with the practice’s growth plans. “This time last year we had a clear strategy of what we wanted to achieve in terms of projects and team growth. We have exceeded expectations and are currently looking for a further senior architect. “The YMD Boon team and I look forward to many more successful years in Derby”. Bondholder Swindell & Pearson is expanding its headquarters by purchasing Number 49 Friar Gate, located in the heart of the Cathedral Quarter. The three storey Grade II* Listed building (built around 1841) provides Swindell & Pearson with the perfect opportunity to continue its expansion plans. Martin Terry, Director, said: “We’re seeing increased demand in our intellectual property services with some impressive growth and new client acquisitions. It was most fortuitous that 49 Friar Gate, located right next door to our current premises, came on the market just at the right time as we were starting to look for additional office space. According to new figures, Bondholder East Midlands Airport has experienced its busiest summer since 2008. Over 3,121,900 people travelled to and from the region’s airport - an increase of 5.72% on the previous year. September saw the end to the busy season with 538,049 people travelling an increase of 6.4% on the previous year. Cargo has also increased by 3.9% compared to last year, with over 30,000 tonnes carried by the airport. Andy Cliffe, managing director at East Midlands Airport, said: “We have seen month on month increases since December last year and for this to have continued throughout the summer season, is very encouraging. It is testament to our colleagues who provide an excellent and safe service for our customers. Representatives from East Midlands Airport have also travelled to China this week, as part of the Midlands Engine trade mission, and have signed Memorandum of Understanding with Ningbo Airport Group. Marketing Derby are proud to welcome G Wathall and Son to the Bondholder community. Managing Director of Bondholder G Wathall and Son Helen Wathall, has recently been appointed as the new Chair of the the St Peters Quarter Derby board. The St Peters Quarter Business Improvement District will be going for re-ballot in February next year. Helen said: “I am delighted to be chairing the re-ballot for the SPQ BID. Over the last five years, the additional improvements the BID has made to our area have been greatly appreciated. Through a business-led programme of investment, the SPQ BID'S vision is to establish the area as a destination by providing an alternative and complementary shopping, leisure and commercial area to intu and the Cathedral Quarter. Bondholder PKF Cooper Parry has just reported its strongest ever financial year, showcasing the company as the fastest growing firm of accountants in the UK. In the financial year up to the end of June 2016, PKF Cooper Parry generated revenues of over £22m– a 29% increase in growth on the previous year’s turnover of £17.2m. The accountancy firm isn't planning on resting on its laurels, and has set a £30m target for this financial year. PKF Cooper Parry is currently the No. 1 accountancy firm in the East Midlands amongst privately owned £5m to £50m businesses. Ade Cheatham, CEO, said: "What is really remarkable is the size and speed of our growth. Our headline figures are very impressive and represent growth across the board, but we have broadened our proposition in several key areas and introduced a number of new service lines, which have contributed to our success." The extension to Bondholder Derby County Football Club's Moor Farm training complex has been given approval. The new development will also see a link bridge between the existing indoor pitch building and the proposed building, plus 208 new car parking spaces. Sam Rush, Chief Executive of Derby County, said: "The training centre will be constructed to the highest possible standards and will be a legacy for both the local community and for the football club."